Home > Uncategorized	> It’s People Like John P. Waters That Confuse Us Historians 100 Years Later. It’s People Like John P. Waters That Confuse Us Historians 100 Years Later. 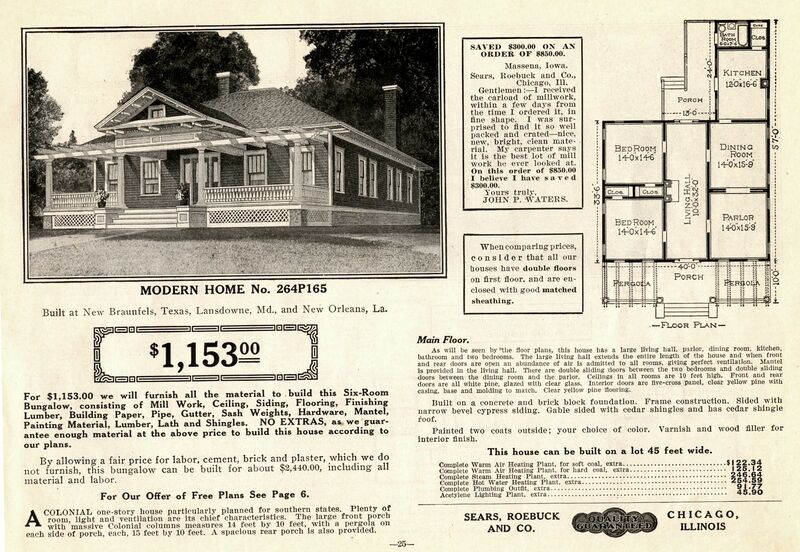 Until I started scanning a 1914 Sears Modern Homes catalog, I’d never heard of Sears Modern Home 264P165. 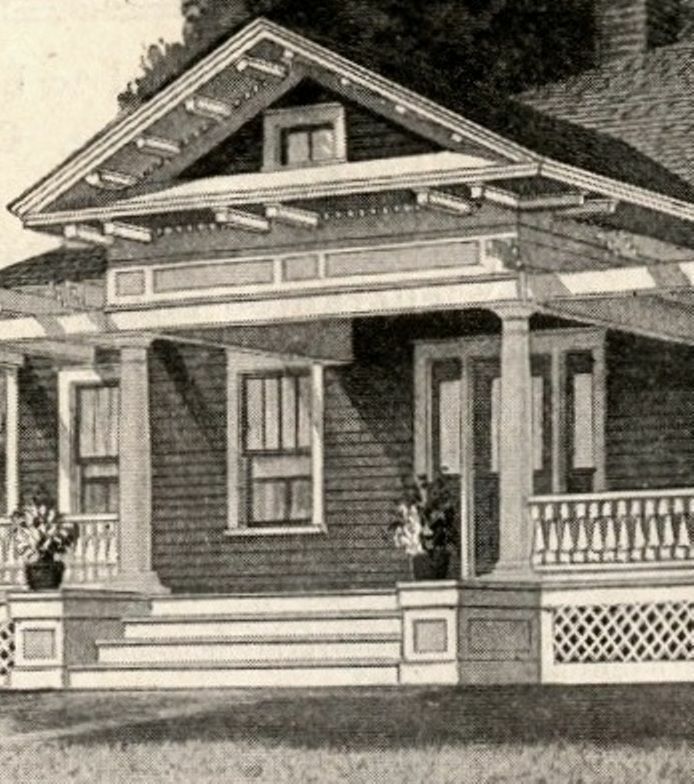 Prior to 1918, Sears Homes were given names rather than numbers, so we know that this unusual-looking home never made it to the 1918 catalog. In fact, it’s not in my 1912 catalog or my 1916 catalog, so it was short lived (to say the least). And yet, by 1914, this house had been sold in New Braunfels, TX and Lansdowne, MD and New Orleans, Louisiana. And it might have been sold to John P. Waters of Massena, Iowa. Reading these testimonials can be a little tricky, and this testimonial written by John of Massena is also a little vague. Did he buy millwork? Or did he buy this house? 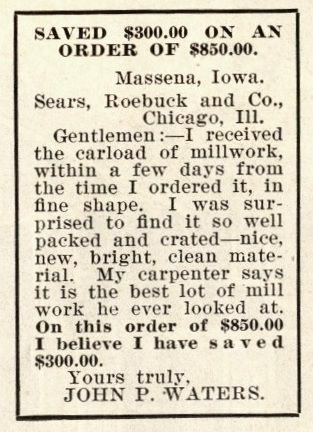 The way this testimonial is positioned, one would surely think he bought Modern Home 264P165, and yet if you read it carefully, it seems more likely that John just purchased some millwork from Sears Roebuck sometime around 1914. Too many times to count, people will approach me and insist that they have a Sears kit home. Despite my best efforts, I’m often unable to match their “alleged Sears House” to the 370 designs that Sears offered in the early 1900s. Because in the early 1900s, it was not unusual for people like John P. Waters to order lumber from Sears. In 1895, Sears started offering building materials (lumber, millwork, windows, doors, sheathing, etc) through a specialty catalog. That was 13 years before the “Sears Modern Homes” program was even a glimmer in Richard Sears’ eye. Or maybe he pulled a “John P. Waters” and just ordered the building materials from Sears. To learn how to “read” lumber markings on old kit homes, click here. To read about the wonderful kit homes of Charlottesville, click here. This house apparently was offered for only a couple years. And yet, there's one in Braunfels, Texas, Lansdown, Maryland and New Orleans, Louisiana (1914). John P. Waters testimonial was for lumber, PROBABLY, and yet it appears on the page next to the picture of the 264P165. The 264P165 was a very unique house, which makes it easy to identify. Here are the cities where three 264P165s were built. Whoa, check out this floorplan! Look at the bathroom! I suppose the occupants were profoundly grateful that this 1914-era kit home even *had* a bathroom, as many of these early 20th Century kit homes did not have "indoor plumbing." And check out the "living hall." It has a fireplace! Have you seen this house? The details around the front porch should make it easy to identify, especially if you're in New Braunfels TX, Lansdowne MD or New Orleans. An additional note: Apparently, Lansdowne is next door to Baltimore! Have you seen a 264P165? Please leave a comment for Rose! This posting made me smile because it sounds just like my dad. He always said the small bungalow on our farm was a kit home. Only he was right. He produced the very catalog, with notes in the margins, from which my great-grandmother bought it in 1924. A Gordon-Van Tine Model 595. I’m nearly done fixing up the inside and hope to start working on the outside this year. I found crating materials from GVT in the attic. And on the back of some of the trim is the GVT stamp along with great-grandma’s stenciled name and address. I am the home and garden editor for The Times-Picayune newspaper in New Orleans. 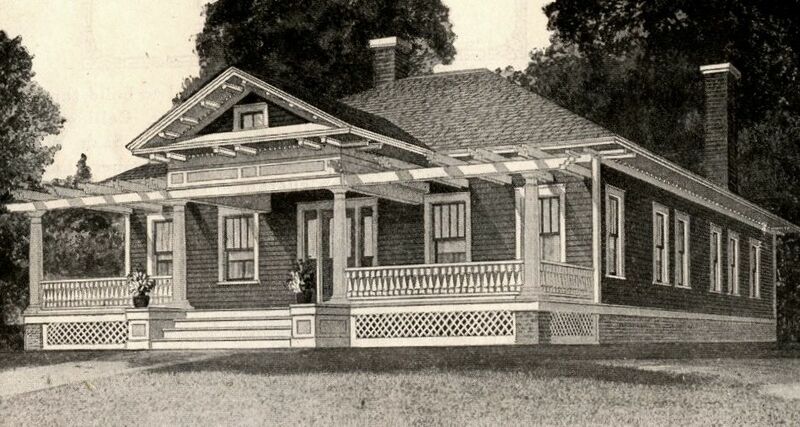 I’ve read your blog with interest, and was curious about Sears Kit homes in Louisiana. Do you know of any that still exist. I’d love to do a story, featuring your book and talking about the Sears Kit homes here. I bought a home in Greensboro, Ga three years ago. Upon researching the floor plan, I have found that it appears to be Sears kit 264P165, with some modifications. The floor plan is a mirror image. It has the same dimension living, center hall, with two rooms on each side and the additional two rooms on the left side with a back porch (now enclosed). My house has two chimneys which open to four fireplaces in the front four rooms. (no fireplace in hall) The porch does not have the pergola. The center hall dimensions match and the front four rooms, minus the fireplace, dimensions match. 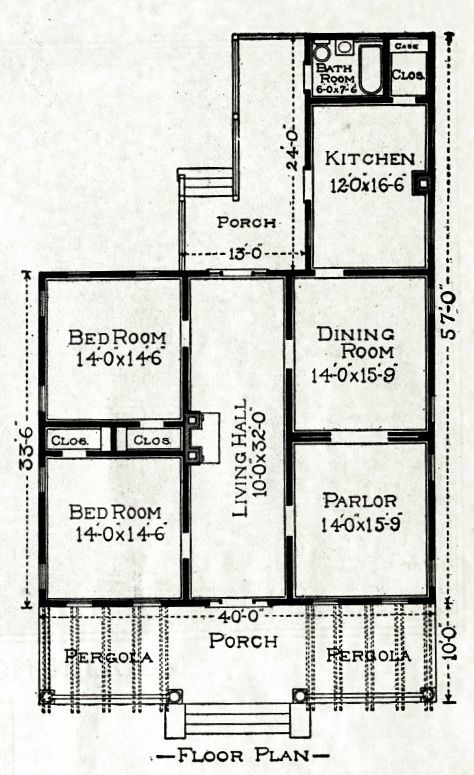 The 5th room (original kitchen on the plan) is the same in width but a foot shorter than the house plan. I read the plans could be adapted based on the buyer’s choices and find the floor plan surprisingly coincidental if the house is not a Sears plan. The house in New Braunfels has been located, it’s still there. Do you have any photos of the New Braunfels house? BTW, I live in Lansdowne, MD and have posted to a local FB page and some websites, and nobody seems to recognize the 264P165. Most of the old homes here have been altered and covered up, so it may still exist under a coat of formstone or vinyl, with the porch having been turned into an extra room. One person I heard from thinks that it may be the house down the street from me that flooded and was torn down. I will try to find a photo of that house and compare it to the catalog picture. If the floor plans could have been adapted to suit the customer, as Ms. Stephens has mentioned, I’ve found a house in Lansdowne, MD that might possibly be the missing 264P165, sadly covered by additions and modifications - to the point that it’s almost unrecognizable. I’m assuming the home could have been built at ground-level, without stairs, if needed. Baltimore County lists this home as having been built in 1900, but the county’s records are notably inaccurate - they list my home 1941, but I have photos of it from the 1930s. The records say it has two stories (because of the addition, I’m sure), and one full bath (as the 264P165 has). The living area is 1604 sf. I have photos from google maps … I guess I need to walk a few blocks and inspect the place more closely.